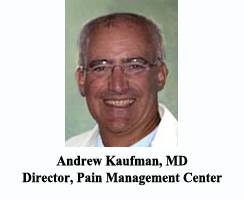 Under the direction of Andrew Kaufman, MD, the Pain Management Center offers treatments for a wide range of acute/chronic pain states. These include, but are not limited to, myofascial pain, neuropathic pain, cervicogenic headache, trigeminal neuralgia, chronic regional pain syndrome, herniated disc, post-laminectomy syndrome, spinal stenosis and post-herpetic neuralgia. Treatment is aimed at eliminating the cause of pain, but many times this may not be feasible. Thus the goal becomes symptom management so that the patient can continue to be functional at work and at home. This is done as a team approach, with the patients and their families being involved to create and meet short and long-term goals. Treatment modalities may include oral or transdermal medications, T.E.N.S. units, epidural injections, facet joint injections or other nerve blocks. In addition, radiofrequency ablation, spinal cord stimulation trials and intra-thecal pump trials are utilized when appropriate. Residents spend a one-month rotation in Pain Management during which time they provide services to patients within the hospital setting, in the Comprehensive Pain D.O.C. offices and at the University Hospital Pain Clinic. They assist with interventional procedures and participate in didactic sessions on a regular basis. Additionally, fourth year medical students have begun a monthly rotation in pain management, working along side residents and attending physicians in providing patient care. The Pain Management Center is playing an important role in the education of residents and students alike in the important and growing field of pain medicine.